With the renewed focus on the Confederate battle flag and what it symbolizes, schools and other public institutions in the South are also taking a look at their history. Do colleges and universities, building a tradition of instilling the highest values, harbor in their past individuals who worked against principles of equality? Do they honor these individuals by naming buildings after them? Clemson is facing such a debate over the legacy of Benjamin Tillman. Faculty have demanded a building named after him be renamed, particularly in light of the recent calls to remove the Confederate battle flag from the state capitol grounds. It’s a valid debate, and the answer is rarely simple — 100 percent in one direction or the other. But it doesn’t hurt to ask. Take, for example, Auburn’s fourth president, Dr. William L. Broun, whom Broun Hall is named after. Before coming to Auburn, the Virginia native fought in the Civil War. Should Auburn be concerned? It’s a valid question. Let’s read the evidence. 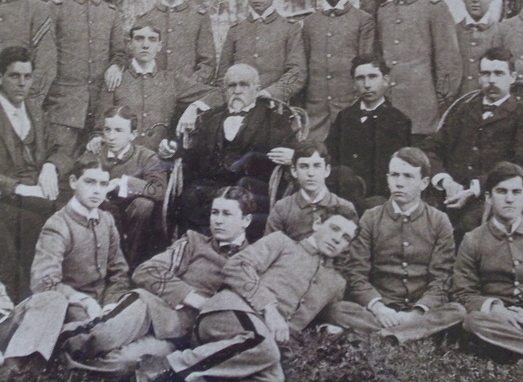 A graduate of the University of Virginia, Broun was actually headmaster of a private school in the state when war broke out. He did not serve in a combat position, but was superintendent of ordnance for the CSA army, at the rank of major. He was later promoted to lieutenant colonel and named commandant of the Richmond arsenal. Some war historians claim that Broun issued the last major command of the conflict — the order to blow up the arsenal before advancing armies could arrive, shortly before Lee’s surrender. But what about Broun’s attitudes toward issues like slavery? Did his views reflect the region’s racial hatred of Reconstruction and the Jim Crow era? We are fortunate that the library has a book of Broun’s life and words, assembled by his family after his death, on its shelves. It’s an excellent starting point (and saves the hassle of going through his papers). The book is titled “Dr. William L. Broun,” and its call number is LA2317 .B7A3. Broun did in fact speak about the Civil War, on Memorial Day in 1891. In recalling the discussions leading up to the war, Broun reminded his listeners of the personal turmoil he and members of the UVA community faced. Theirs was the legacy of Thomas Jefferson and James Madison, in intellect and politics. So while Broun would seem to side with those who sidestep the slavery issue, he definitely saw secession as a dead issue, post-war. But did Broun have personal experience with slaveholding? Broun and his father-in-law, Dr. George Fleming, bought a plantation in Houston County, Virginia, during the war, and Broun moved his family there. Apparently Dr. Fleming was a slaveowner, and his slaves were sent to the plantation. While these can still be problematic words to some, they are certainly preferable to the racial hostility expressed in the late 1800s and early 1900s by Alabama politicians, some of whom have buildings named after them. Beyond that, nothing of Broun’s that is included in the book — in correspondent or memoir form — addresses race-related topics. He does show a progressive spirit, advocating for the education of women at Auburn during one non-dated baccalaureate address and does so without condescension. Broun’s most enduring and visible contribution to the campus is the reconstructed Samford Hall, which was built after its predecessor burned in 1887. He also was behind the renaming of the University from Alabama Agricultural and Mechanical to Alabama Polytechnic Institute. But his most important contribution might have been his role, as one of the South’s most respected educators, in building Auburn’s academic reputation. When he died in 1902 at age 72 — while getting ready to go to work — colleagues and journalists hailed his life and work. In discussing Broun’s life, it must be acknowledged that other building namesakes do not fare as well, on balance, particularly those named after Alabama governors. The racist speeches of Gov. B.B. Comer (1907-1911), for whom Comer Hall is named, are easily found, as is his family’s usage of leased convict labor — an inhumane system that he perpetuated as governor. And Gov. David Bibb Graves (1927-1931, 1935-1939), for whom Graves Amphitheatre is named, though progressive in his philosophy, used his Klan leadership to political advantage and blocked his attorney general from prosecuting floggers, though he resigned his Klan membership soon after he was elected governor. But their legacies deserve a deeper treatment, and they are not as closely tied to Auburn as Broun was. When Dr. William L. Broun’s life and legacy are examined, it’s wrong to categorize him with the Benjamin Tillmans. True, he was in many ways a product of his times, but his times — and Auburn — were better because of him.